This edited article about Mont Blanc originally appeared in Look and Learn issue number 761 published on 14th August 1976. On the evening of 8th August, 1786, Dr. Michel Paccard and his friend, Jacques Balmat, strode out of Chamonix, the little village at the foot of Mont Blanc to try and climb to the summit of this highest peak in the French Alps. Very little was known about Mont Blanc, or the “Accursed Mountain” as the local people called it. Paccard and Balmat had nothing to guide them except scraps of information gathered from local mountaineers who had ventured only a short distance up the mountain, whose higher reaches were considered unclimbable. By nightfall, the two men had reached a ridge called the Montagne de la C√¥te. There they wrapped themselves in rugs and rested until three o’clock the following morning. At dawn they started off towards the Grand Plateau, a great snow basin from which the final slopes of the mountain rise. The plateau was swept by strong winds, which at times forced the climbers to their knees. They climbed steadily upwards: the cold grew more bitter with every step and the thin air made breathing difficult. At times their progress was very slow. 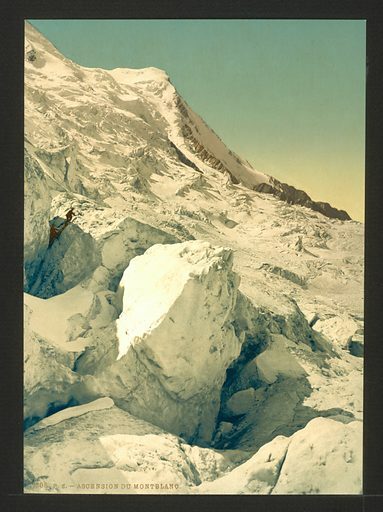 The conquest of Mont Blanc wrote the first chapter in the history of mountain exploration. It was a great achievement 190 years ago, when there were no scientific aids to mountaineering and not even a technique for climbing.